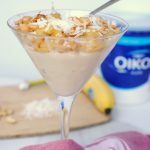 Disclosure: Thank you to Dannon Oikos for sponsoring this post. We have been compensated for our time. As always, all opinions are our own and reflective of products and brands we trust. We love plain Greek nonfat yogurt for its flavor, creamy texture, and versatility, as well as its nutrition benefits. You’ll find us using it like sour cream on savory dishes, adding it to smoothies, using it in baking recipes, and grabbing it for snacks. 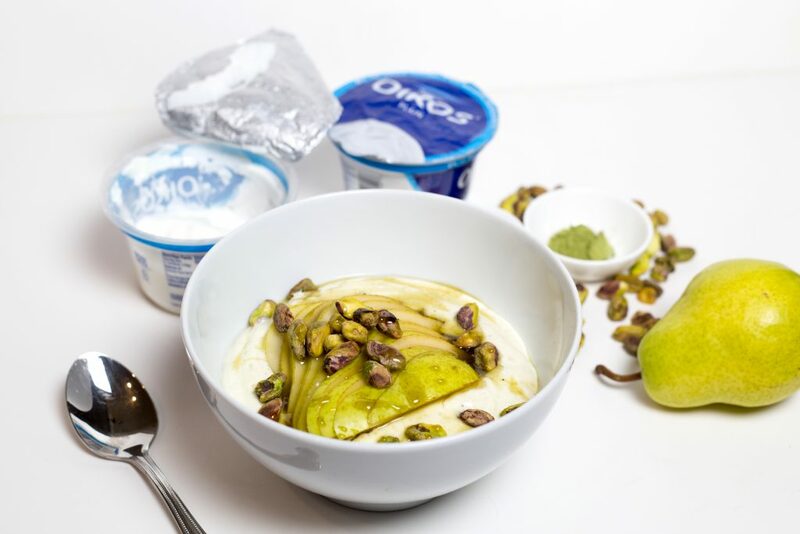 Aside from being a delicious blank canvas, we tend to gravitate towards plain Greek yogurt because it’s a really easy way to add calcium and protein. 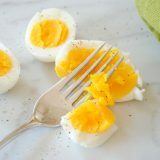 This is especially handy for us at breakfast and snack times, when it can be a little tougher to get a protein boost. Including protein in meals and snacks can help your meal feel more filling since protein is one of the most satiating nutrients. Research has indicated that a higher protein breakfast can leave you feeling more satisfied the rest of the day. One cup of plain Greek yogurt contains 22 grams of protein, which gives you a major protein burst right off the bat. Another benefit of yogurt is that you get live and active cultures. 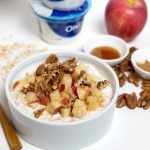 At this point, you’ve probably not only heard of these but also eaten them before… but, just in case, yogurt cultures are friendly bacteria that help contribute to the balance and diversity of bacteria in your gut, which is associated with better health. These “good bacteria” in yogurt actually help digest some of the lactose, which is why some people who can’t tolerate certain types of dairy can often have yogurt. So back to this blank canvas. 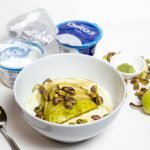 Plain Greek yogurt is just waiting for you to add creative flavors to it and Fall inspires a lot of great flavors! We’ve come up with four combos we think you will love as much as we do. They are easy to make but definitely will sufficiently impress guests at an impromptu fall breakfast or brunch. 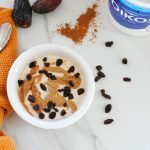 Here’s a special COUPON CODE (it expires 12/31/17) to pick up your own Oikos yogurt and start getting creative! 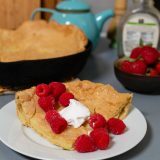 These all make one breakfast-sized serving, but feel free to double (or triple) the recipes to serve more people or halve them for a snack-sized portion. 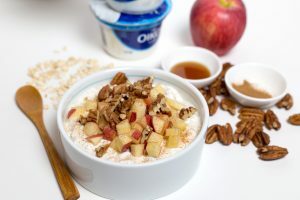 Add yogurt, drained dates, and pumpkin pie spice to a blender or food processor and puree until smooth, scraping down the sides as needed, 1-2 minutes depending on your blender. Stir together almond butter and ginger until smooth. Pour yogurt mixture into a bowl. 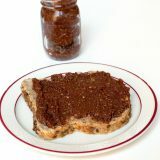 Drizzle almond butter over the top and sprinkle with raisins. Stir the maple syrup and cinnamon into the yogurt. Add the oats and half the chopped apple and stir until combined. Top with remaining half of the chopped apple, the toasted pecans, and a sprinkle of cinnamon. Place yogurt, half the pear, 1 tablespoon pistachios, and 1 teaspoon honey into a blender or food processor and puree until smooth, about 1 minute. In a separate bowl, stir remaining teaspoon of honey, vanilla, and matcha together. Pour the yogurt mixture into a serving bowl. Top with remaining slices of pear, remaining tablespoon of pistachios, and drizzle with the matcha honey mixture. Mix 1 teaspoon of brown sugar with the vanilla extract and cinnamon. Slice banana into 1/4 inch slices and toss with brown sugar mixture. Place slices on a parchment-lined baking sheet and broil on high until banana is golden and sugar has started to caramelize, about 1 minute. Remove from heat. 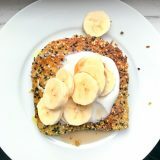 Add yogurt, half the broiled banana, and the remaining teaspoon of brown sugar to a blender or food processor and puree until smooth, about 1 minute. 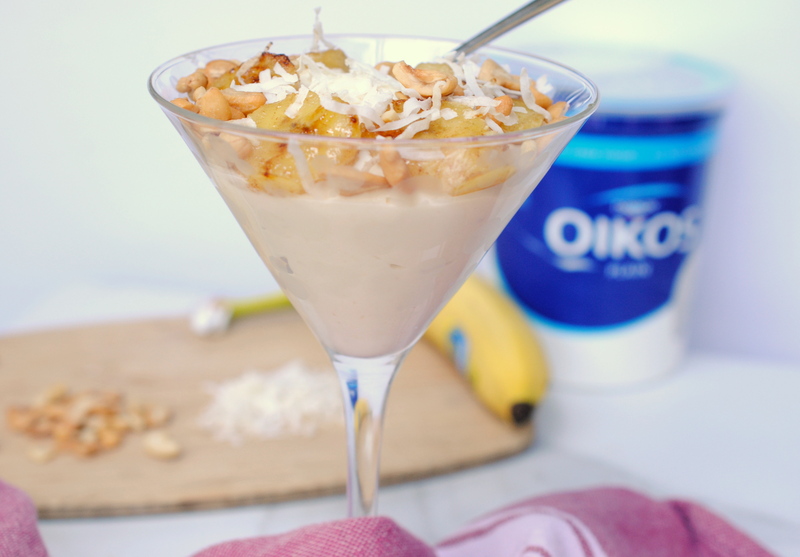 Pour mixture into a bowl and top with the remaining broiled banana, cashews, and coconut. You always have recipes that are so creative. I can’t wait to try them! Thank you! We love starting with a blank slate and getting creative with flavors. Can’t wait to hear what you think! All four of the recipes using plain yogurt look very good, especially the cinnamon roasted banana. I use plain yogurt on baked sweet potatoes in lieu of butter or sour cream. The roasted banana is one of our favorites because it changes the flavor of the banana to a more caramel-like flavor! We love your idea to use plain yogurt on baked sweet potatoes — that sounds delicious! I want to try to make a creme brulee using yogurt. 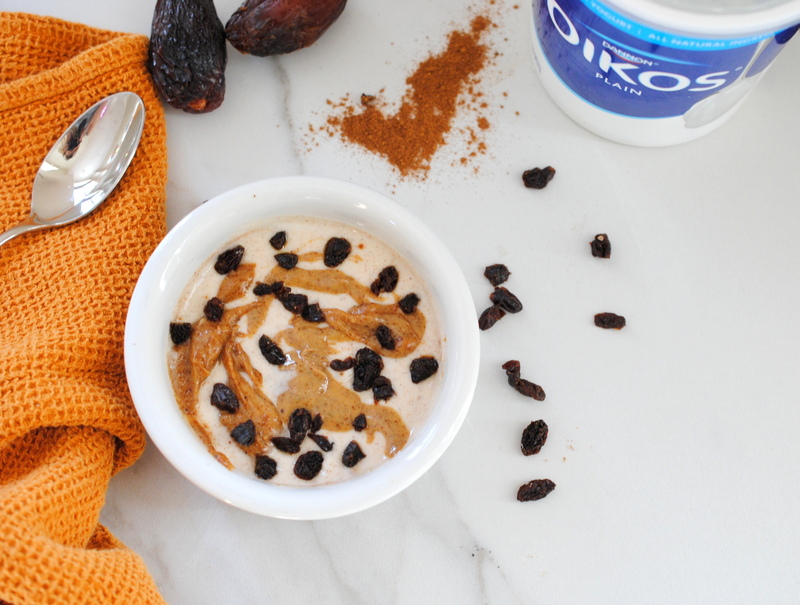 It looks like plain Greek yogurt might be the place to start. 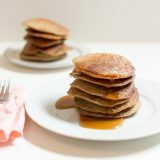 There are all yummy looking, especially the recipe with roasted bananas. That sounds like it would be delicious and tangy! Can’t wait to hear how it goes.